I speak to you today of the faith of our pioneer forefathers. We can attribute much of the remarkable progress of the Church and of this state of Utah to their faith in the Lord Jesus Christ. We stand in awe of their resolve and tenacity in holding fast to their convictions despite the obstacles they had to overcome. We delight in our faith in our Savior today. We testify to the world that “the words of Christ will tell you all things what ye should do.”5 As members of the Lord’s Church and as faithful advocates of His restored gospel, we declare soberly that God lives, that Jesus is, indeed, the Christ, the Savior and Redeemer of the world. Tomorrow is Easter, a day to ponder the mission of Jesus Christ, the Firstborn Son of our Heavenly Father. The Atonement, including the Resurrection of the Savior, provides immortality and the possibility of eternal life for all of our Father’s children. How grateful we should be for these blessings. We declare gladly to all who have “ears to hear”6 that the Lord, “knowing the calamity which should come upon the inhabitants of the earth, called upon [His] servant Joseph Smith, Jun., and spake unto him from heaven, and gave him commandments”7 to restore the fulness of the gospel that the Saints of earlier days had. We testify “from the top of the mountains”8 that President Gordon B. Hinckley is God’s prophet on the earth today. 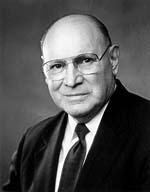 Because of our faith in our prophet, Latter-day Saints echo the words of the Apostle Peter: “We have therefore a more sure knowledge of the word of prophecy, to which word of prophecy ye do well that ye take heed, as unto a light which shineth in a dark place, until the day dawn, and the day star arise in your hearts.”9 The light of divine revelation shines forth from a living prophet to brighten a darkened world. The exciting global growth of the Church has focused our attention on the prophesied glorious future of the kingdom. At the same time that we look ahead with optimism, we should pause and look back on the faith of our humble pioneer forefathers. Their faith built the foundation on which the Church continues to flourish. Fearing more of the mob violence that had claimed the lives of the Prophet Joseph and his brother Hyrum on 27 June 1844, Brigham Young, leading the Church as President of the Quorum of the Twelve Apostles, announced in September 1845 that the Saints would leave Nauvoo in the spring of 1846. Most of those in Nauvoo believed fully that when Brigham Young announced that they must leave, they were hearing what the Lord wanted them to do. They responded in faith to the direction of the Lord. Throughout the fall and winter months of 1845–46, Church members set about vigorously making preparations for the journey. Though winter’s chill was not yet past, heightened fears of mob attacks and swirling rumors of government intervention compelled President Young to set things in motion to get the Saints under way. He directed the first company of pioneer families to leave Nauvoo on 4 February 1846, a cold winter day. They drove their laden wagons and their livestock down Parley Street﻿—a street that became known as the “Street of Tears”﻿—to a landing where they were ferried across the river to Iowa. Chunks of ice floating in the river crunched against the sides of the flatboats and barges that carried the wagons across the Mississippi. A few weeks later, temperatures dropped even further and wagons could cross the river more easily over a bridge of ice. Once across the river, they camped temporarily at Sugar Creek before starting their trek west toward the Rocky Mountains. The journey, which historian H. H. Bancroft described as a migration without “parallel in the world’s history,”17 had begun. When President Brigham Young joined the departing pioneers at their campsite in Iowa on 15 February 1846, the Lord revealed to him to begin organizing a modern “Camp of Israel.” On the first of March the advance company began its push westward across Iowa. Hardships caused by cold, snow, rain, mud, sickness, hunger, and death challenged the faith of these hardy pioneers. But they were determined to follow their leaders and to do, no matter the cost, what they believed fervently to be the will of God. Their faith was challenged, and for some it faltered in especially difficult times. But it did not fail them. Many were sustained by the assurances they had received in temple ordinances performed in the Nauvoo Temple. What a sacrifice these good sisters made! Some mothers lost their own lives in childbirth. Many babies did not survive. My wife’s grandmother, Elizabeth Riter, was born at Winter Quarters in the back of a covered wagon during a rainstorm. Fortunately, both the mother and the newborn infant survived. With great love for the woman who gave life to her, Elizabeth often lovingly recounted how an umbrella was held over her mother throughout the ordeal to shield her from the water leaking through the wagon’s cover. Let us dedicate ourselves to doing the Lord’s work to the best of our abilities. May we honor the faith of our fathers by giving our own faithful service to this great cause. May we “follow the prophet”27 and by so doing “come unto Christ, and partake of the goodness of God,”28 I pray humbly in the name of Jesus Christ, amen. Lectures on Faith , 1. JST, 2 Pet. 1:19; cf. KJV, 2 Pet. 1:19. In Conference Report, Apr. 1902, 2. Quoted in Deseret News, 26 Feb. 1996, A2. Quoted in Church News, 10 Feb. 1996, 3. “Faith of Our Fathers,” Hymns, no. 84. History of Utah , 217. As quoted in B. H. Roberts, A Comprehensive History of the Church, 3:45. Joseph L. Wirthlin, A Heritage of Faith, comp. Richard Bitner Wirthlin , 47. Ensign, Nov. 1992, 48; see 1 Sam. 3:4.